If you think the ratings for tonight's Patriots-Broncos playoff game are going to be of record-setting caliber, just imagine what they would be on a Sunday afternoon. Traditionally, Saturday nights are not great nights for television ratings, which could possibly prevent any records from being set by tonight's playoff game. 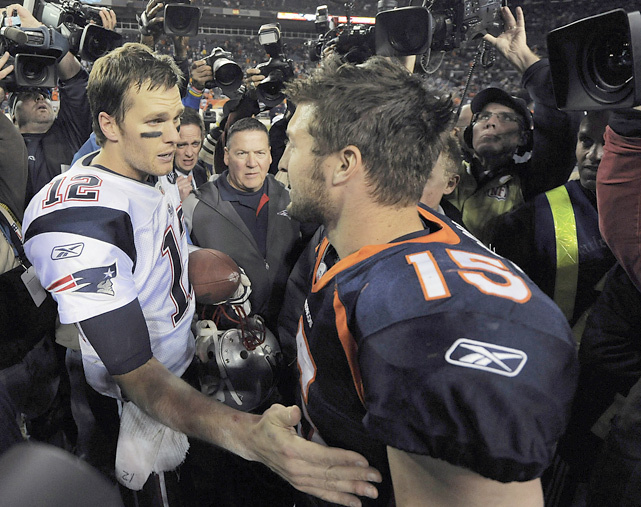 The last time the Patriots faced the Broncos, the game recorded a 19.5 overnight rating, as 28.2 million people made it the highest rated game for CBS since 2007. Add this to last weeks 42.4 million viewers that watched Tim Tebow and the Broncos beat the Stealers, and this sets up the potential for record-breaking ratings for tonight's game. The only problem is that tonight's game could produce better ratings had it been scheduled for tomorrow, in the 4:30 time-slot. Late Sunday afternoon games generally do exceptionally well in the ratings. The 4:15 and 4:30 start times produce better ratings than the earlier 1:00 time slot due to the added west coast audience that a later time brings in. Had this time been given for the Patriots-Broncos game, it is very possible that many records would be set. Given the current time, this game will likely not reach its full ratings potential. The NFL is very upfront, and focused on giving its games the opportunity to assume the maximum amount of exposure they can receive. One such example in recent years is the way in which the NFL has handled its flex scheduling. It is very possible that had the NFL been able to make a change in start time for tonight's Patriots-Broncos game, it would have done just that. A disappointing effect of tonight's game time is the inability to truly measure what the appeal of Tebow brings to the ratings. With so many potential marketing opportunities for the NFL involving Tebow, knowing exactly what he can bring to the ratings would be a great measurement for the league. Instead, an unpopular time-slot will have to do. It will be a great moment.